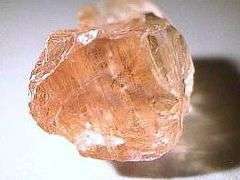 For the mineral calcite used in navigation, see Sunstone (medieval). For other uses, see Sunstone (disambiguation). Sunstone is a plagioclase feldspar, which when viewed from certain directions exhibits a spangled appearance. It has been found in Southern Norway, Sweden and in various United States localities. The optical effect appears to be due to reflections from inclusions of red copper, in the form of minute scales, which are hexagonal, rhombic, or irregular in shape, and are disposed parallel to the principal cleavage-plane. These inclusions give the stone an appearance something like that of aventurine, hence sunstone is known also as "aventurine-feldspar." The optical effect called shiller and the color in Oregon Sunstone is due to copper. The middle part of this crystal sparkles, and usually the color is darkest in the middle and becomes lighter toward the outer edges. The feldspar which usually displays the aventurine appearance is oligoclase, though the effect is sometimes seen in orthoclase: hence two kinds of sunstone are distinguished as "oligoclase sunstone" and "orthoclase sunstone." Sunstone was not common until recently. Previously the best-known locality being Tvedestrand, near Arendal, in south Norway, where masses of the sunstone occur embedded in a vein of quartz running through gneiss. Other locations include near Lake Baikal in Siberia, and several United States localities—notably at Middletown Township, Delaware County, Pennsylvania; Plush, Oregon; and Statesville, North Carolina. The "orthoclase sunstone" variant has been found near Crown Point and at several other localities in New York, as also at Glen Riddle in Delaware County, Pennsylvania, and at Amelia Courthouse, Amelia County, Virginia. Sunstone is also found in Pleistocene basalt flows at Sunstone Knoll in Millard County, Utah. In the early 2000s, a new variety of red or green gemstone resembling sunstone and known as 'Andesine' appeared in the gem market. 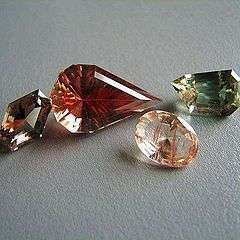 After much controversy and debate, most of these gemstones, allegedly sourced from China, were subsequently discovered by retailer JTV to have been artificially coloured by a copper diffusion process. However, a Tibetan source of bona fide (untreated) red andesine was eventually verified by a number of independent groups of well-respected gemologists. A variety known as Oregon sunstone is found in Harney County, Oregon and in eastern Lake County north of Plush. Oregon sunstone contains inclusions of copper crystals. Oregon sunstones can be up to three inches wide. The copper leads to variant color within some stones, where turning one stone will result in manifold hues: the more copper within the stone, the darker the complexion. On August 4, 1987, the Oregon State Legislature designated Oregon sunstone as its state gemstone by joint resolution. ↑ Sunstones at Sunstone Knoll, Millard County. Utah Geological Survey, accessed September 14, 2007. ↑ Huges, Richard W. (14 November 2011). "Tibet Andesine Mines; Part 2". RWH Publishing. Retrieved 9 November 2014. ↑ Huges, Richard W. (3 November 2010). "Tibet's Andesine Mines". RWH Publishing. Retrieved 9 November 2014. ↑ Abduriyim, Ahmadjan (10 September 2009). "A Mine Trip to Tibet and Inner Mongolia: Gemological Study of Andesine Feldspar" (PDF). GIA. Retrieved 9 November 2014. ↑ Abduriyim, Ahmadjan (2009). "The characteristics of red andesine from the Himalaya Highland, Tibet". The Journal of Gemmology. 31 (5-8): 134–150. ↑ Abduriyim, Ahmadjan; Kobayashi, Taisuke (2008). Laurs, Brendan M., ed. "Gem News International: Visit to andesine mines in Tibet and Inner Mongolia; Gemological properties of andesine collected in Tibet and Inner Mongolia". Gems & Gemology. 44 (4): 369–373. ↑ "Rock Hounding: Oregon Sunstone--Official State Gemstone". Nature of the Northwest. Oregon Department of Geology and Mineral Industries. Retrieved 7 March 2013. Wikimedia Commons has media related to Sunstone. Saab, Patricia. "Oregon Sunstone". The Oregon Encyclopedia.